Suddenly, in a distant corner of their Manhattan loft, two phones rang. The girls stopped, their eyes locking on each others’. There were only two phones in the loft, and they were both in the attic. An attic that the girls thought–were certain–had been closed off for the rest of their lives. “THE PHONE IS RINGING! SOMEBODY GODDAMN GET IT!” Yelled Loretta/Elizabeth. 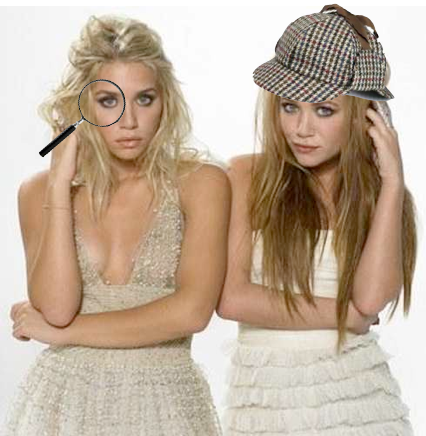 Mary-Kate and Ashley blinked and both headed for the door. The stairs to the attic creaked as the twins ascended. Mary-Kate reached the door first and opened it with less effort than she thought a door that old and heavy would require. Maybe her juice cleanse WAS making her body stronger. She smiled to herself as Ashley joined her in the room. At the same time, their eyes fell upon the old wooden table, covered in cobwebs, and adorned with two rotary telephones. “Why did we have rotary phones? Those were old even when we were kids,” wondered Ashley aloud. “What happened to Clue?” Mary-Kate asked, pointing to the mummified remains of their dog lying in a chair next to the telephones. They both felt a deep, primal urge calling from the depths of their nature to start singing, but there wasn’t enough time. It had already taken them half an hour just to make it up the stairs, and yet, the phones were still ringing. The pair approached the table and, with a nod to each other, picked up the receivers. The girls hung-up their phones and exhaled sighs. At the same time, they were both thinking the same thing: what the hell were they doing taking cases this late in the game? They’d retired, hung up their hats, killed their dog through neglect. This was a young girls’ game, and here they were getting back into it. But, they’d made a commitment, and dinnertime was fast approaching. “You ready?” Ashley walked over to the wall, picked up her trench coat (which, luckily, still fit from when she was in elementary school) and turned to Mary-Kate who was already dressed in hers (which, frankly, seemed a bit big on her now).